The orchestra program of the Bloomington schools dates back to the early part of the last century with archives indicating participation in the Indiana State Music Contests as early as the 1920s. The famous Indiana educator, Newell Long, was at one time the director of the Bloomington High School orchestra. Bloomington High School South assumed the history and heritage of the Bloomington High School when the new high school, Bloomington High School North opened in the fall of 1971. BHSN was built as a result of school consolidation in 1968 that formed the Monroe County Community School Corp. Unionville High School, Smithville High School and University High School become one as BHSN. As you will learn through this timeline, there have been constant, almost yearly, struggles within our program to keep it solvent and alive. Public schools are always faced with financial difficulties, and usually the arts are looked at as something that can be eliminated when dollars are hard to find. Within the arts it seems that orchestra is that one offering always at the bottom of the list — we’re “fluff” and typically the smallest class/ensemble. In this past history it seemed there was nothing we could do but accept administrative and school board decisions. This is why the Jane A Gouker Endowment is so very important! Tough financial times are sure to return. The Endowment is one way to ensure that the monies are there to fund whatever string level or orchestra class that would need it. It is our “insurance package”; it is our pro- active way of being prepared for the worst, and knowing we can still provide our future generations with the best! Our timeline starts in the school year 1980-81 for two distinct reasons. This was the very first year that MCCCSC offered an elementary string program for grade 5 students. Grade 5 was chosen because, at the time, the MCCSC school alignments were: K-5 in elementary schools, grades 6-8 in middle school (and there were 5 middle schools), and 9-12 at the 2 high schools. 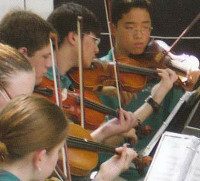 Students in the middle schools already had the opportunity to take strings. This elementary program was created because the high school programs were in complete disarray, and needed a feeder system, and because the school system hired Jane Gouker as their new high school director, and she insisted on this when interviewed and offered the job. Obviously it would take time — at least 4 years — to impact the high school orchestras. This initial year, 119 students signed up for the new 5th grade string program. The classes were taught during the school day, as a “pull out” program. Students would go to the assigned room for strings at a certain time when the traveling string teacher would come to their school. April 23, 1981: In spite of the above, the school board cancelled both the North and South high school orchestra classes due to budget constraints and low enrollment. But with public outcry, and the suggestion of a cross basis, the board approved a dispensation for the high school orchestra salary and established an “early bird” class. This class would be held at BHSS at 8:15 (pre-school start time then) for North and South Orchestra students combined. Students’ families had to get the students to school; a shuttle bus took the North students back to North in time for 2 nd period. The enrollment of this early bird class: North had 5 students; South had 9 for an orchestra total of 14. No class is offered at all for BHS North orchestra students. “Not enough students signed up” was the reasoning. South’s enrollment increased to 24, and that was acceptable. To counteract this and assure this did not happen the next school year, Ms. Gouker (who will be referred to as Ms. G throughout) wrote letters to all known string students at North to keep in touch with them and offered an after school ensemble (on her own time with no pay) to keep them playing. BHS North Orchestra is re-established as a class. MCCSC decides to change the grade alignment of the school district. All 6 th graders are now placed in elementary school. The five middle schools become just two, and contain 7 th and 8 th graders. The two schools are Batchelor (includes previous Binford M.S. students) and Tri-North (includes University M.S., Unionville M.S. and Dyer M.S.). This greatly affected the string program, as we lost 4 middle school classes and now have 2 levels of ability at the elementary level, with no increase of elementary string staff. Tri North Middle School loses one of the two orchestra classes. March 17, 1986: MCCSC school board recommends: additions – reducing secondary student to teacher ratio, gifted talented program, social workers, support success, and adds 6 per school high school band directors; reductions – high school agribusiness, restructure elementary strings by taking away 0.5 (1/2) teacher. MCCSC Elementary string program becomes all pre-school morning program, and 5 former sites are eliminated. Donald K. Neal, longtime and highly respected string/orchestra educator of our school system, retired and is not replaced. Batchelor M.S. loses 1 of its 2 orchestra classes. The entire secondary level of the orchestra program is now taught by Ms. G, as she has BHSN, BHSS, Tri North and Batchelor. The elementary 6 th grade string level (now referred to as “continuing strings” as they are second-year players) had been shoved in with the beginning classes with the re-alignment. Ms. G offers to teach the 6 th graders separately (at least for one lesson of the week) during her prep period, which is first period. Student musicians’ families bring them to BHS South for that class, and students are bussed back to their home school. MCCSC elementary strings receive a 20 percent increase for the 6 th grade continuing strings! There is now a North site and a site at Rogers for the South side. This increase came as a result of many, many town people and orchestra boosters speaking at a school board meeting and disagreeing with what was supposed to be yet another reduction of elementary strings. Since the above was just a one-year dispensation, the 6 th grade continuing strings is back to one site, one day. It meets at Fairview and is taught by Ms. G on Wednesday mornings. 6 th grade continuing strings classes are increased to 2 sites, but only because the elementary program is realigned to allow it. No more teaching time or staffing has been allotted or approved. Beginning sites are consolidated even more to offer this class as it is critical to retention of our players. Curriculum decisions are passed by the school board that will greatly affect all music. Foreign language will now be offered at middle schools as an elective, as is entire music program. Students only get one elective. Star of Indiana starts a 5 th /6 th grade band program after school. There will be a new middle school – Jackson Creek. In the building proposal there is NO orchestra room. And the auditorium will seat only 300. Orchestra parents are initiated to help voice concern over this, and the board agrees to have architectural designs changed to include an orchestra room along with the planned band and choir rooms, and to increase the size of the auditorium. Jackson Creek Middle School opens, and MCCSC now has 3 middle schools. However, with the student population shift, there is no orchestra at Batchelor. Through appeals, Batchelor students are offered orchestra at Jackson Creek as it is first period of the day. They are bused back to Batchelor in time for 2 nd period. Ms. G teaches BHSN, BHSS, Tri North and Jackson Creek. Jackson Creek M.S. receives another orchestra period, now offering 2 classes. As Ms. G will continue as director of Jackson Creek, along with BHSN, BHSS and Tri North, the daily schedule proves impossible. Superintendent Dr. John Coomer approves, and assigns, a new assistant high school orchestra director to alleviate the problem: Ms. Juli Enzinger. Orchestra gains a full-time teacher! Over 400 string students perform in the annual String Spectacular on Jan. 10, 2005. During the concert, Ms. G receives a framed announcement from Bloomington Mayor Mark Kruzan proclaiming Jan. 10 as Hoosier Youth Philharmonic Day in honor of her 25 years as director. The Hoosier Youth Philharmonic will be traveling to perform in Honolulu, Hawaii, over spring break. A Music Advisory Panel is formed of teachers and parents from ALL levels and areas of MCCSC music programs to address concerns. In particular is the middle school elective options, which makes it difficult for students in music and is not equitable across the board. Another concern is the new “Twenty First Century Scholars Program,” which encourages high school students to take classes that will count toward their ultimate college credit, usually at the expense of electives. Also, next school year the MCCSC will be opening New Tech High School, which will offer NO arts classes. MCCSC transportation asks Ms. G to come up with a way to save money for the transporting of elementary string students. Ms. Enzinger suggests that elementary strings become “centralized” by having continuing and beginning strings on the same days at the same sites, eliminating the need for so many busses. Elementary string program (in entirety) is put on the chopping block by MCCSC school board due to financial crisis. A task force is formed by the orchestra to try to raise the needed money to pay for the program, for at least a year, which is estimated to be about $20,000 for teacher pay and transportation. The Board hosts a “community meeting” at BHSN on Feb. 14, 2010, as many other programs (but strings is the only musical program affected) are designated to be eliminated, and the public is outraged. High school string musicians volunteer to play music before the meeting — and they speak to the board, along with dozens of parents and orchestra alumni. After all is said and done, we are told that we can “try” to raise the money and the Save Our Strings force is challenged to do so by May 14, 2010. Plans include everything from a faculty recital to donation jars in stores throughout the city and county. Monies can be donated through the MCCS Foundation, and dollars start pouring in. But, there is fear there won’t be enough. Joshua Bell, a Bloomington native, former school orchestra musician, and now world-renowned concert violinist, holds a benefit concert in April at the IU Musical Arts Center to raise the needed funds. He donates all proceeds from the concert to go to the MCCSC elementary string program and raises $24,500. The elementary program is saved!! But this is a wake up call. The Bloomington people vote in favor of a tax referendum for the school system! Jackson Creek M.S. and Batchelor M.S. both lose an orchestra class, going from 2 classes to 1. June 2, 2011 In spite of the referendum, a contract is presented to the MCCSC faculty by the teacher’s union who has been working with administration. It is proposed to eliminate all extracurricular pay stipends and, therefore, eliminating all extracurricular programs, including sports. “Nothing” will happen after 2:30. For us: no concerts, no tours, no public ensemble playing, no ISSMA contests. Immediately Tina Peterson, MCCS Foundation Director, starts investigating what her organization might be able to do. More than $200,000 is needed to restore the positions Many, many fundraisers are created from golf scrambles to silent auctions to the “largest car wash” ever. Teachers and school board members march side by side in the July 4 th parade to raise public awareness. The money is raised! All extracurricular activities are saved. Feb. 14 is declared Hoosier Youth Philharmonic Day by Mayor John Hamilton in honor of the HYP being invited to perform at the Capital Orchestra Festival at the Kennedy Center for the Performing Arts in Washington, D.C. May, 2016 Ms. Gouker announces her retirement after 40 years (36 within the MCCSC) of teaching. November, 2016 Again Bloomington and Monroe County votes vote to continue the tax referendum for the schools! Thank you!! MCCSC school board approves a beginning band program at the 6 th grade level, in direct conflict with our existing elementary string program — same days/same times.